Group to Pte J L Tadman, SJAB, on sale at BidorBuy. A Group of Three Medals Awarded to Private J.L. Tadman who served with the St. John Ambulance Brigade during the Boer War. 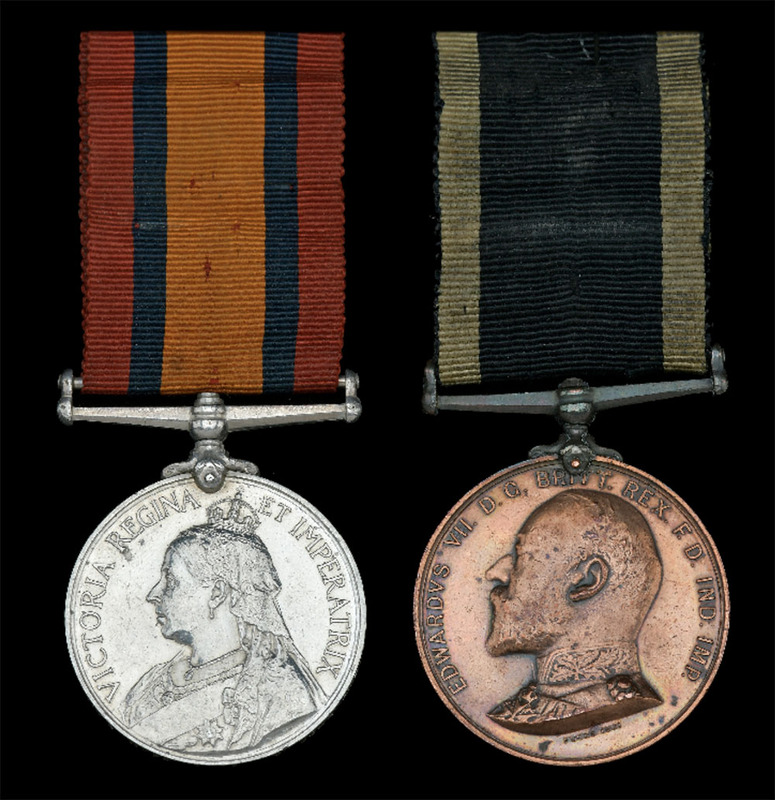 Royal Norfolk Veterans Association (1909) Medal: Unnamed as issued. 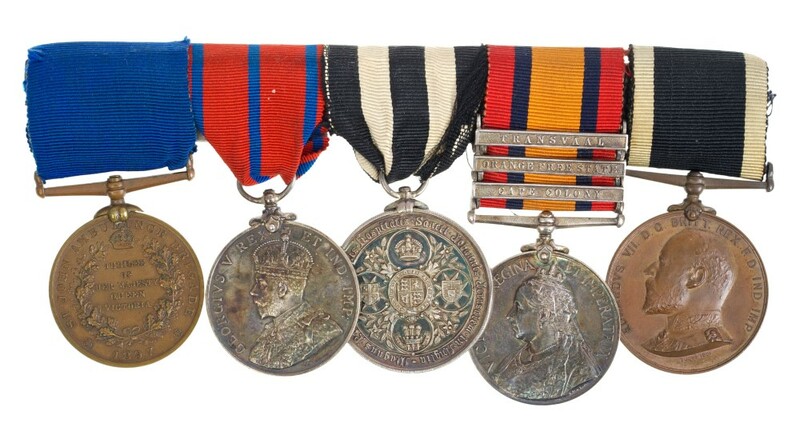 Both the St. John Ambulance medal and the Royal Norfolk Veterans Association Medal are scarce. The QSA is confirmed on the medal roll and his service with the St. John Ambulance on their roll. 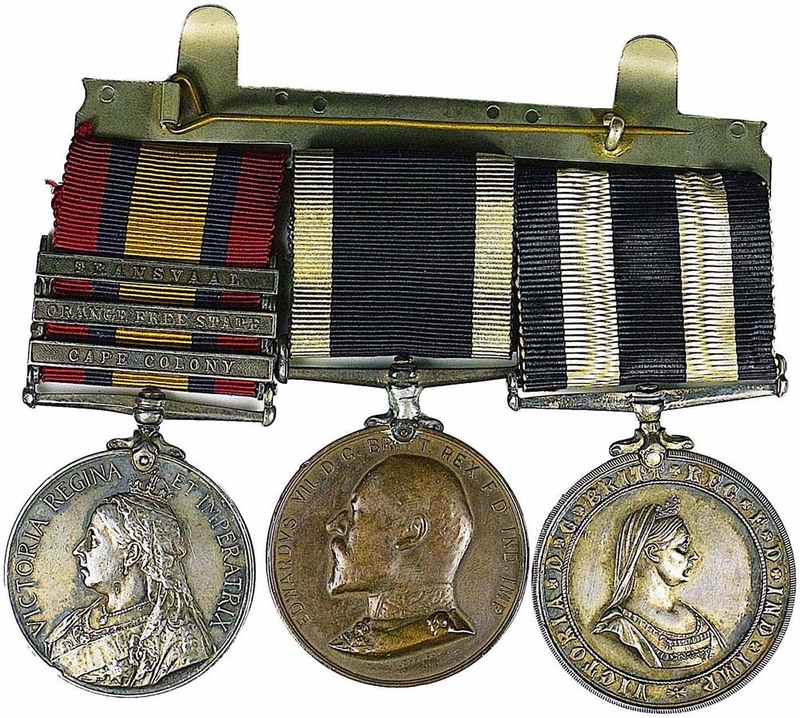 Except for the noted defects, the medals are in good condition with the original ribbons, mounted for wear on a bar. The suspension bar on St.J.A. medal has become severed from the medal. The claw on the RNVA medal has rotated off the vertical. J.L. Tadman was with the Great Eastern Railway (G.E.R) Division of the St. John Ambulance Brigade. The G.E.R operated a Railway network between London and Norwich and other destination in Norfolk and East Anglia. Tadman volunteered for service in South Africa and was stationed at Number 11 General Hospital in Kimberley. In 1909 the Norfolk Veterans were inspected by King Edward VII. Tadman received the medal here for the occasion. He probably wore this group of three medals at the Royal review. Note: Tadman also was presented with the Norwich Tribute medal for his volunteer service in the Boer War. This is not a military award and I am listing the medal separately. I just noted this thread and decided to set aside Christmas Cookie Baking to read thru logs of my previous ABW collection and found two SJAB's to reference in Vol 1 & 2. SJAB Medal, 1643 PTE. J. R. WOOD, WHALEY BRIDGE DIV. My note indicates I acquired this from Kaplan for $50.00 US but not when at that price. I did note the one to MOORE was not listed above. This interesting group sold yesterday for a hammer of £800. Interesting Victorian and later St. John Ambulance medal group - comprising Victorian Jubilee (Police) medal 1897, named to 2nd Class Supy Offr A. Mackness. (one of 910 issued), George V Coronation (Police) medal 1911, named to 1st Cl. Sgt. A. G. Mackness., Service medal of the Order of St. John, named to 1st Class Sergt. A. G. Mackness. 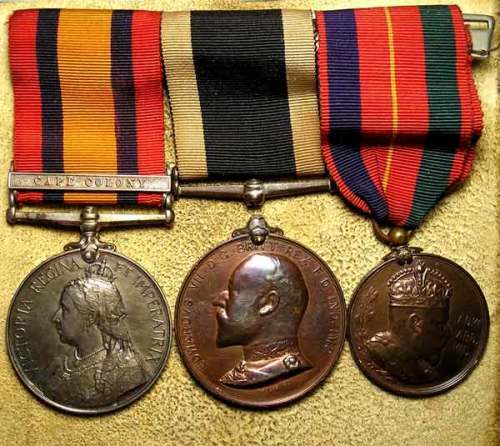 8th July 1907, Queens South Africa medal with three clasps - Cape Colony, Orange Free State and Transvaal, named to 26 Sply Ofcr. A G Mackness. St. John Amb. BDE. and Edward VII St John Ambulance Brigade medal for South Africa, named to 26. 1st C Sergt. A. Mackness. Northampton Corps. (mounted on bar), together with mounted ribbons. Sold with SJAB East Yorkshire War Service enamel badge No 4072, SJAB Assocoation Cross to Walter Barton 77289 with date clasps 1916-18 and 1921-28 all numbered 77289, ribbon bar for first 2 medals, 3 SJAB buttons, 1914 Princess Mary Xmas tin with Xmas card and OHMS Rail Warrant issued by No 20 General Hospital, Elandsfontein to Pte W. Barton dated 18/4/1901.